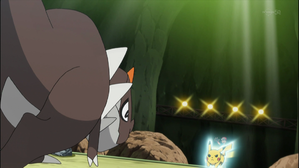 » Episode Guide » Viewing Episode: ショウヨウジム戦！ピカチュウ対チゴラス！！/Shoyo Gym Match! Pikachu VS Chigoras!! The Castle on the Seabed! Kuzumo and Dramidoro!! Peroppuff and Peroream!! A Sweet Fight Gets Anything But Sweet! ?